For those affected, the burden of these diseases, on average, equates to the loss of 56 years of healthy life through early death or chronic disability. Yet, the United States Centers for Disease Control estimates that for 50 cents per year per person, the burden of neglected tropical diseases could be eliminated. After the anthrax attacks of 2001 the U.S. government launched project Bio-shield, a large-scale program aimed at developing organisational capacity and medical countermeasures to deal with existing and emerging biological threats to the U.S. population. Vast quantities of drugs and vaccines have been stockpiled by the Biomedical Advanced Research and Development Authority (BARDA). BARDA and the U.S. military medical services have also partnered with hundreds of small biotechnology companies to develop medical countermeasures against pathogens that could potentially be used for bio-terrorism. As well as ZMapp, BARDA is funding three other companies in the early stages of developing different countermeasures against Ebola virus disease. Australia has benefited from this U.S. military interest. The anti-serum against Hendra virus infection and the equine vaccine are the products of a coalition between the CSIRO and US military medical services. Millions of dollars were spent on developing countermeasures for an Australian bat-borne pathogen that, as far as we know, has only killed four people. Horse-owners in Queensland have been slow to take up the vaccine, but the US military considers this research worth the investment. Agents effective against Hendra are also likely to have protective effects against the related Nipah virus. Because of its potential for “weaponisation”, Nipah virus is classified as a likely bio-terrorism agent. Rare, albeit high-impact, infectious diseases are not able to sustain a market driven by the needs of those at immediate risk of infection. Yet because of perceptions about their potential impact on the developed world, these infectious pathogens pose challenges to national security. 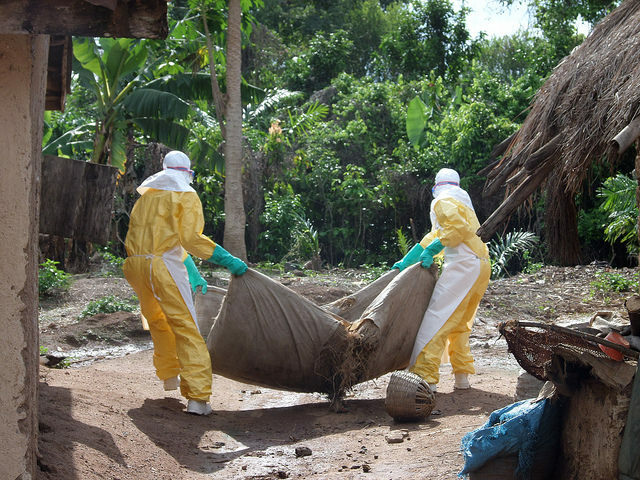 The pursuit of effective drugs against Ebola virus disease is arguably part of a larger shift in the governance of infectious disease and other public health risk from prevention to preparedness. Médecins Sans Frontières’ Philippe Calain and the anthropologist Andrew Lakoff both contend this shift has seen the rationale for many public health interventions move from health concerns towards security concerns and economic interests. Organisations such as the International Monetary Fund (IMF) and World Bank have driven this transformation by framing emerging infectious diseases as threats to markets and economies. Now, countries in what is known as the Global North (rich, developed countries that make up about a quarter of the world’s population) increasingly perceive people dying from infectious diseases in the Global South (poor, underdeveloped nations) as a risk to their own health and well-being. Efforts to enhance the latter’s public health capacity and develop new drugs for infectious threats such as Ebola virus disease are driven by the perception of a need to protect the Global North from external threats. Andrew Lakoff describes two regimes of global health: one focused on instituting systems to establish global health security, and thereby mitigate threats to developed countries. And one focused on the humanitarian relief of neglected tropical diseases in the developing world that helps their populations escape poverty. Pointedly, Lakoff argues the second regime is being offered to the developing world as a palliation for accepting the first, which impinges on their sovereignty and places constraints on how resources can be used. Within the new system for the global governance of infectious disease, policies aimed at protecting the Global North from pathogens become a set of “shared” global health objectives. But past national policies of stockpiling drugs and vaccines raise questions about the extent to which the Global South will benefit from any biomedical innovations. Still, as international health law expert Sara Davies points out, we need to be careful not to view the politics underpinning moves towards global health securitisation in a wholly negative light. Even though efforts to develop treatments of Ebola virus disease are driven by U.S. national interest, in the next few months they might prove to be in everyone’s interest. Chris Degeling receives funding from the Canadian Institutes of Health Research and the Marie Bashir Institute for Infectious Disease and Bioseciurity. After reading reports of the Ebola virus’s virulent spread — with corpses left on the street and hospitals closing because of dangers to untrained health workers — I asked to be sent to Liberia. Other countries affected by the epidemic, like Sierra Leone, had received more news media attention, but when the situation in Monrovia was described as catastrophic, that got my attention. For me, a journalist’s responsibility is to cover difficult stories, not necessarily dangerous ones but challenging ones. And given the spread of this deadly virus, the challenges were many.